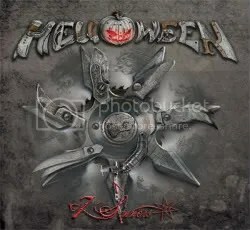 Up to this point, I’ve never been what you would call a “fan” of Helloween. 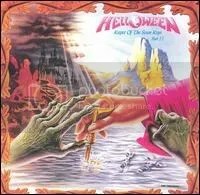 I own Keeper of the Seven Keys Part II and the Treasure Chest compilation but like with most power metal — I think of Helloween as a fluffy, flowery, keyboard-heavy metal. Not really my thing. I know not all power metal bands follow this formula but it seems to be the norm. Feeling that way, I really wasn’t going to give a new Helloween album a second (or even first) thought. But then I ran across the video for “Are You Metal?” and was surprised at just how heavy it was. It’s a true heavy metal anthem! Then I found out if you pre-ordered the album you got a t-shirt, a small poster signed by the band and the CD all for $20. So I figured why not? I’m glad I ended up getting the album. I’ve ready many reviews saying it’s the heaviest Helloween has been in a long time (if ever) and it’s certainly a HEAVY metal album. The band does fall back onto the keyboards from time to time but they more than make up for it with the anger on “Where The Sinners Go”, the anthem “Are You Metal?” and the creepy “Who Is Mr. Madman?”. It’s really the first four songs that are the best on the album. “Raise The Noise” is another good metal anthem (even though it has a Jethro Tull moment in the form of a flute solo). This song sounds like something Sister Sin would record. “The Smile Of The Sun” is a very good and powerful ballad. One of the few things I think Helloween has always nailed is their ballads. Overall, the album has become one of my favorites for the year. There are a few bland moments. Specifically, “Far In The Future”, which limps the album to a close but from top to bottom the album is full of solid METAL with so many sing-along moments and much more metal than I ever expected from Helloween. Are they metal? Yes they are! I’m a sucker for power ballads and Helloween has done two of the best power ballads I’ve ever heard with “In The Middle Of A Heartbeat” and “Forever And One (Neverland)”. They were the two main reasons I bought this compilation album (which features remixes and remasters), though I also wanted to give the band another chance after disappointing me a few years earlier with Keeper of the Seven Keys Part II. After listening to this album, I have a greater appreciation for the band, but I’m completely content with owning this compilation and not delving into the band’s catalog unless I get an extremely strong recommend from someone. A limited edition box set was also released featuring a third CD showcasing the band’s B-sides. Another pick up from the late 90s. I was trying to get into power metal at the time and Helloween’s name kept coming up on message boards and websites, so I gave’em a shot. I also remember WWE wrestler Chris Jericho’s column in the Metal Edge magazine raving about them. Jericho was actually a big enough fan to base his ring name and one of his finishing moves (the Walls of Jericho) on Helloween. The funny thing is, I picked this album up by mistake. I wasn’t really schooled on Helloween yet. All I knew was that Keeper of the Seven Keys was a two-parter, and I thought Part II was the superior album, but it’s actually Part I that is considered better, if you pay attention to other reviews. Helloween has done some great songs elsewhere, but I just can’t get into this album. It’s actually pretty bad outside of the really catchy “I Want Out”. I think one major issue I had is I was expecting something heavier and not as keyboard-heavy. This album turned me off to listening to any of their other albums. 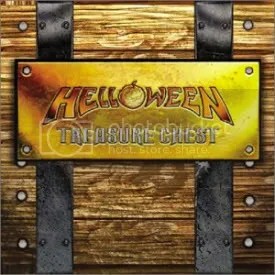 I’ll stick with the Treasure Chest compilation for my Helloween fix.